News about our projects, the drought, green community news, and regulations that affect our customers. Here are just a few snapshots of an impressive residential rainwater system we’re installing in Orange County, California. It’s exciting that the owner wants to be efficient with water – one really has to think this way in the Golden State these days! Since the residence is under construction we will be installing a state of the art graywater system as well. Stay tuned! California Drought Regulations – what’s new? Although California urban water suppliers have managed to use 29% less water in May, and up to an inch of rain fell across southern California during an unusual summer storm last weekend, the years-long drought condition still persists. Some are calling it a 1,000-year drought, and experts agree it will take years of above average rainfall to get the state’s water levels back to normal. It’s a great time to think about install a system that recycles graywater or captures rainwater, helping you save money and reduce demand on water supplies. Request a Quote today! The major news that smart property owners are talking about is the looming required cuts in water use. 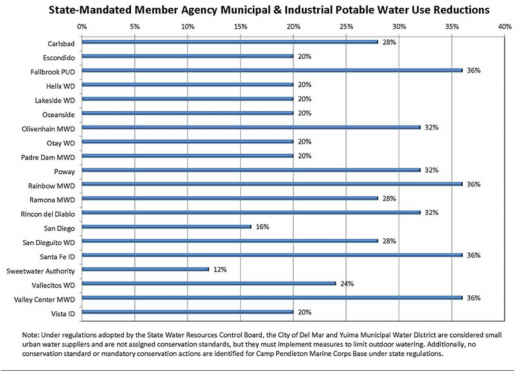 A simple overview of the results of Executive Order B-29-15 is that urban areas with higher water use per capita will be required to save more water than those who are currently using less. In areas where water use is low, required savings are only 4%. The requirements go to as high as 36% in some parts of the state. We at Water Recycling Systems, LLC will keep working to inform you about the mandates. Call Water Recycling Systems, LLC anytime to get started on a graywater recycling or rainwater capture system. We can help you save money, and reduce demand on the water supply. By now the whole world knows it rained in Southern California this weekend. In many parts of the state, it’s difficult to remember the last time it really rained. Such is the nature of our historic drought. On Saturday, about 1” of rain fell on parts of San Diego. Doesn’t seem like much? Water Recycling Systems’ customers with rainwater capture systems know that when 1” of rain falls, for every 1,000 square feet of roof/catchment area, they have renewed their tanks with about 623 gallons of water that can be used for irrigation and flushing toilets. And since we know that the average person uses about 19 gallons of water to flush toilets per day, we know that this rainstorm provided a water-savvy family of four about 8 days of rainwater for their toilets. Not bad for a rainy day! With a reported El Nino season on the way, let Water Recycling Systems, LLC give you a quote for a rainwater capture system. Here’s the link to our website, www.reusegraywater.com. Just so happens, it’s the Santa Monica Public Library, Pico Branch. And how do we know? Because we designed and installed the Rainwater Capture system. At the Pico Branch Library, Water Recycling Systems installed a rainwater capture system anchored by a12,000-gallon rainwater tank during construction. Now, every time there’s a ‘1-inch rain event’, our system captures 8,300 gallons from the building roofs. In an average year of rainfall, this equates to 100,000 gallons. For the full story on this historic LEED Platinum project, check out this video! Overall, our rainwater capture system replaces 80% of the expected annual demand from toilet and urinal flushing in the facility! Check out the Pico Branch Library website. The City of Santa Monica is the Poster-Child for environmental awareness. Sustainability, conservation of natural resources and a strong environmental conscience were high on their agenda long before they were popular and politically correct civic attributes. Over a year before California Governor Brown declared a “Drought State of Emergency”, supported by President Obama, Santa Monica was taking aggressive action to conserve our most precious natural resource. Simply put, The City of Santa Monica ‘get’s it’. 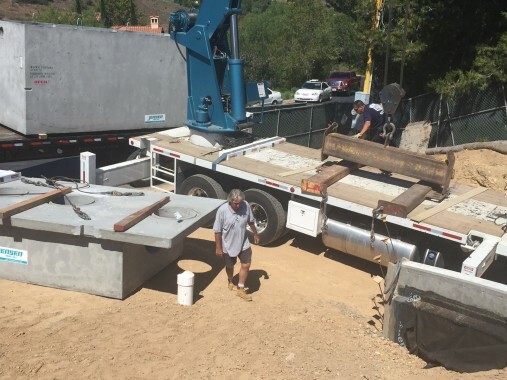 So it’s no surprise Water Recycling Systems, LLC was chosen to build and install the Rainwater Capture and Reuse System for their new Pico Boulevard Public Library. They could have selected anyone…they chose us. The overall system was conceived and designed by Kevin Poffenbarger, Principal PE at EPD Consultants, one of the leading water reuse Engineering Companies in the world. Working with Kevin’s designs, we built and installed a system that automatically filters, disinfects, stores and delivers safe, reliable recycled rainwater to flush all toilets and urinals throughout the facility. Equally notable is the fact that despite being under extreme regulatory and code compliance scrutiny by nine City, County and State agencies, the system passed inspection with absolutely no correction needed. We are the leading environmental resource company in the world specializing in providing innovative and practical water conversational systems. Follow the installation on our website, www.reusegraywater.com in the Photo Gallery Section, on Facebook, Twitter and LinkedIn. And feel free to contact us for all your water reuse questions and needs.